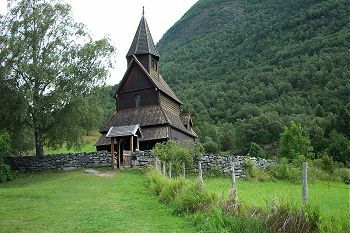 The Urnes Stave Church (ca 1050) is the oldest of its kind in Norway. Between the 11th and 14th century about 1200 Stav-churches arose in Scandinavia. The Vikings were being christianized at that time, but also held on to their own beliefs. In this their ships played a central role, and so they constructed their churches as if they were ships. Only 30 of these extraordinary shaped churches remain. According to the WHC, "The church brings together traces of Celtic art, Viking traditions and Romanesque spatial structures." The worldheritage sites I like best are those that require some effort to get to. That's also the case with Urnes: a flight, a local bus, a hired car and a small ferry (and 4 hours) took me there. The Urnes church lies high on the slopes. Because of its relatively small size it cannot be seen from below. After a steep climb you are rewarded by this sight that is both very familiar (I've seen lots of pictures) and striking (its almost perfect shape). Visitors to the site (and they are relatively numerous in summer) can go inside the church with a guide. Explanation is given about its history. That it has been rebuilt several times but that there are some original elements left. And that it is still used as a church, once a month during the summer months. My husband and our daughter drove to Urnes to see the Stove Church. We spent the night across the fjord from Urnes at a hotel in Wallaker. Took the ferry ride across and visited the great sight of the church. We had a reason to want to see it as our last name is Urness. The cemetery around the church had many headstones with the name Urnes on them. The name got changed from Urnes to Urness when the grandparents came to the US. It was well worth the trip. We wanted to find out more about our heritage but couldn't find anyone to talk to. I visited Urnes in November 1983 primarily to see the iconic carvings i'd studied in an old Larousse art history book. I had no idea of the difficulty in getting there from Oslo but guessed at the nearest train stop on the Bergen rail line and hitchhiked to a town in the right direction. In Solvorn by lunchtime the next day I found myself on the last ferry across to Urnes. 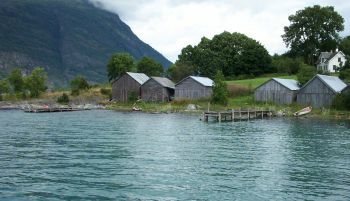 The wonders of the exterior almost made a night in a boatshed along the edge of the fjord worthwhile. Although the church had been closed to tourists when i was there, a death in the village (and a lift back to town with the local builder who turned out to be a contracted gravedigger) allowed me to gain access the next morning. Highly recommended. I doubt it would be so beautiful if it were not so isolated. After a long and hot summer trip to Greece I decided to wind down for a couple of days in my beautiful neighboring country Norway. I had already visited most of the World Heritage Sites in Scandinavia but not yet the Stave Church of Urnes, a fact that had annoyed me for some time. So it was now high time to “tick it off” as my 146th site. Once in Oslo I embarked on the Bergen-train and traveled up the mountains to Myrdal where I hopped off in order to take the world-famous Flåm-banan down to the fjords and here catch a connecting bus to Sogndal. Flåm-banen is a major tourist attraction in itself and as the train slowly makes its 860 meters way down to the fjords, through tunnels and mountainsides, you can enjoy a wonderful view including mountains, waterfalls and small villages. In Flåm you can catch ferries to Bergen and other destinations along the Norwegian coast. My bus trip from Flåm to Sogndal took about 2 hours and on it’s way it passed through the 24,5 km long Laerdal-tunnel, the longest tunnel in the world. At the time I was ignorant enough not to be aware of it’s existence and certainly not of it’s length so after some 15 minutes of traveling through the tunnel I was beginning to wonder whether this was a surreal dream where I was captured in the mountain!??? Despite my worst worries the bus did get out and arrived in Sogndal and Sognefjorden shortly after. The landscape in Sognefjorden - Norway’s longest fjord - is really Norwegian landscape at its best. It is here were the high mountains slopes rushes straight down into the fjords and narrow roads are winding its way up and down the mountainsides. The area is not very densely populated so its the perfect place to find a nice and quiet corner of Europe and enjoy the solitude or wander in the mountains. 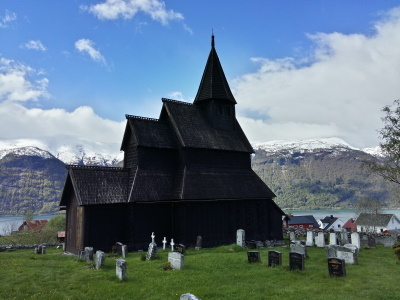 The most comfortable way to get to the Urnes Stave Church is by car. For myself, traveling by public transport only, it had to be an expensive taxi ride from Sogndal to Solvorn were a small ferry boat took me across the fjord to Urnes, a small village with only 200 inhabitants that seem to specialize in raspberry cultivation (try some, it’s delicious). From the ferry you have walk for a kilometer up a steep small road that ends right by the Stave Church, a B&B and a museum. The wooden church itself is very small and smell of tar. Inside it is dark and not room for more than 30 or 40 people. 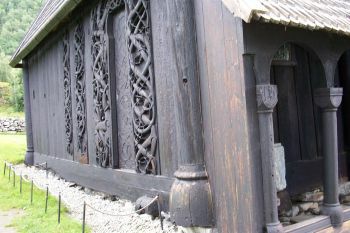 The interior is a mix of cultural influences where the oldest bits are medieval runic inscriptions thought to go back as far as to to the Viking age as well as 16th, 17th-century pulpit, altar and sacristy. The view from the church and the cemetery overlooking the fjord is absolutely astonishing and if you have the time I strongly recommend you to stay at the B&B in Urnes for a couple of days. I saw pictures of this church at Disneyworld's Epcot Center Stave Church model in the Norway Section of the park. It almost brought tears to my eyes. Truly one of the world's most remarkable pieces of architecture, in no small part because of its age and for what it represents in terms of the Chistianizing of a barbaric culture. Truly fascinating.